You don’t need to be the biggest power user in the world to run out of power outlets. With everything needing juice all at the same time, and more and more technology entering the home, there’s always going to be the need for an appliance that can take a single power outlet and turn it into something with a little more room to breathe. Bonus points are awarded for anything that can also protect anything that is plugged into it, too. Like this one. 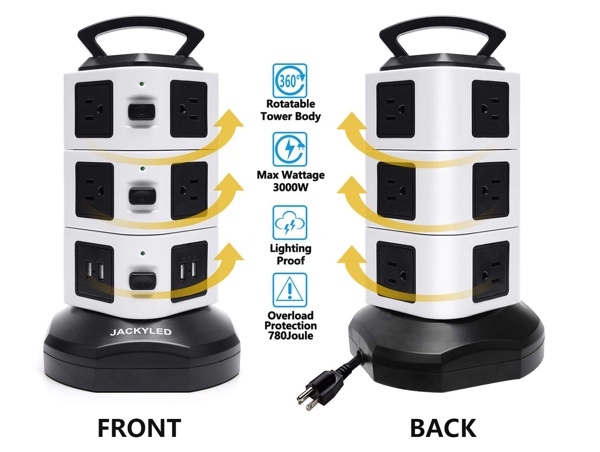 We’re talking about this JACKYLED power strip, or more accurately, power tower. It comes with a lengthy 6-feet extension cable and at the end of it you’ll find ten power outlets as well as four USB ports, perfect for charging anything and suited to use under a desk or behind an entertainment center. If you have any equipment that needs electricity but could also use being protected by a surge protector, this is a great option for you. The whole thing rotates, too, making it easier to plug things in when needed. Did we mention that the 6-feet extension cord is retractable? That saves you from having unsightly, and perhaps dangerous cabling coiled up anywhere which can be a real issue if you don’t quite need all 6 feet but find yourself in need of something longer than the next available option. We’ve all been there! So, what are you waiting for? Pick the deal up today before it’s too late. That accompanying discount code is your ticket to get the price cut that lured you here in the first place.